Cape Report: Prepare for Nationalisation. The general-secretary of Cosatu has said that nationalisation is going to happen. And the task team created by the ANC regarding nationalisation was not looking at it's feasibility but rather at what type of model to implement. He said that all parties present at the last ANC national executive meeting supported nationalisation. And that if the ANC had proposed a study merely looking at the feasibility of nationalisation it would have been immediately rejected by all parties at the meeting. As far as the tripartite alliance is concerned, nationalisation is a given fact. Nationalisation would mean the state seizure of mines,banks, pensions, and all mineral wealth and farmland. No compensation would however be given for land. The general-secretary said it's a natural asset that should be owned by the state and used by farmers. The mines and banks would be given compensation but “not in a way that will cripple the state”. This essentially means that they won't pay market value for the mines and banks as even a fraction of this amount would cripple the state. The ANC supported nationalisation in their national executive meeting, so there is obviously large support within the ANC. 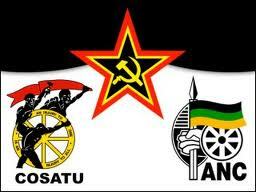 Nationalisation is after all one of the main pillars on which the ANC's founding document the Freedom Charter is built. The National Democratic Revolution (NDR) cannot be fully implemented without nationalisation as “worker hegemony in all sectors of the state and society” would otherwise not be able to be achieved. The fact that the ANC has publicly been silent in condemning nationalisation comes as no surprise. The next phase after the NDR is the full socialisation and so-called“workerisation” of society. Interestingly this is very similar to the North Korean term of “workingclassization” (which their regime has insisted is a proper English word!). In effect they are the same thing, to have only one class in society, the working class. A 'classless' or in this case a 'single-class' society is one of the main principles of a Communist state, alongside state ownership of all land, resources and industry. And this is what the ANC, the tripartite alliance and the ANC Youth League are saying they support. Mining provides the most foreign investment for the country and is almost solely responsible for allowing SA to be a middle-income country with a decent strength currency and exchange rate. While the farming industry, even though farmers are half the amount since 1994, still provides food for the nation. Yet the government still wants to seize control of these sectors no matter the damage it would do to the economy and food production. Several African countries have publicly warned the ANC not to nationalise the mines and land since it has failed in their own countries. These types of policies have proved to be disasters in all other African countries leading to collapsed economies, civil war and famine. Let us hope the same does not happen to South Africa.